Make soaps in any shape you want! Learning how to make soap making molds opens up a world of possibilities for your crafting projects. Instead of being limited to the molds at your local craft store, you'll be able to make soap in any size and shape you can imagine. Soap making molds are an essential component of learning how to make homemade soap. The mold is what determines your soap's finished size and shape. Soap making molds can be purchased wherever supplies for soap making are sold. When you're just getting started soap making, the price of molds can be rather prohibitive, however. Even if you use coupons and keep an eye out for sales, you may find yourself unable to afford more than one or two molds. 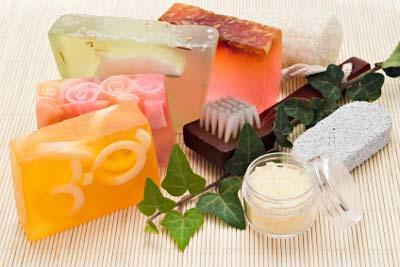 Luckily, there are several alternatives to commercially produced soap making molds. If you've dabbled in candle making at some point, remember that any candle making mold can be used to make homemade soap. Simple votive or small pillar molds will make basic looking soaps, while stars, hearts, and other decorative shapes can be used to design soaps with a spa-worthy appearance. If you don't have any of these items in your own home, ask friends and family if they have any they would be willing to donate to your project in exchange for a bar or two of homemade soap. Depending upon where you live, you can also try purchasing these items at garage sales, thrift shops, or consignment stores. When looking for kitchen supplies to repurpose as soap making molds, remember that plastic and stainless steel items tend to work the best. Ceramic or glass containers can make it hard to remove your soap from the mold without cracking. Buy a small length of two or three inch PVC pipe, plus caps for the ends of the pipe. Look for a test cap, since regular caps are rounded on the end and won't make a flat bottom when you pour your soap. Place a cap on one end of the pipe. Use PVC cement to create a tight seal. Stand the pipe up so it won't fall over. Pour your prepared soap into the pipe. Wait for soap to harden. A mold made from PVC pipe will create a log of round soap. To cut the soap into individual bars, simply use an old cheese slicer or a very sharp knife. Crafters who have basic woodworking skills or who can find someone to help with the project may wish to make their own soap molds from scrap lumber. Wooden soap molds are durable and very versatile, making it easy to create large batches of your favorite handmade soaps. Make a plywood rectangle the size of your finished batch of soap. A good size for general purpose soap making is 15 by seven inches. A box that is between four and five inches deep will let you cut the bars sideways to get more finished soaps from one batch. Use hinges to attach sides to your mold. This will ensure that it is easy to remove your block of soap, because all you'll need to do is fold the sides down and pop the soap out. To make your soap, simply line your soap mold with plastic wrap or old plastic grocery bags to keep the soap from sticking to the wood.